Let's face it. 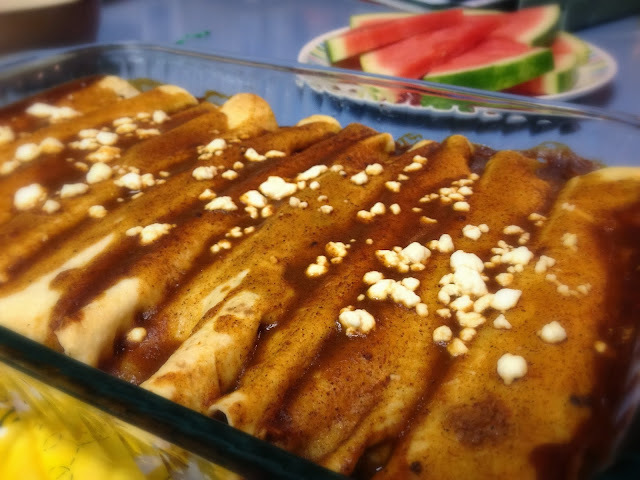 Enchiladas really aren't that pretty. At least, once they come out of the pan. I think they look adorable all wrapped up and squished together in a pan, covered in sauce and sprinkled with cheese, but after? Ugh. At least the avocado is pretty. If you know a good way to get an enchilada out of the pan, intact and looking gorgeous, let me know. Somehow Sara over at Sprouted Kitchen managed to make them look amazing, but, yeah. I don't think I have that gift. 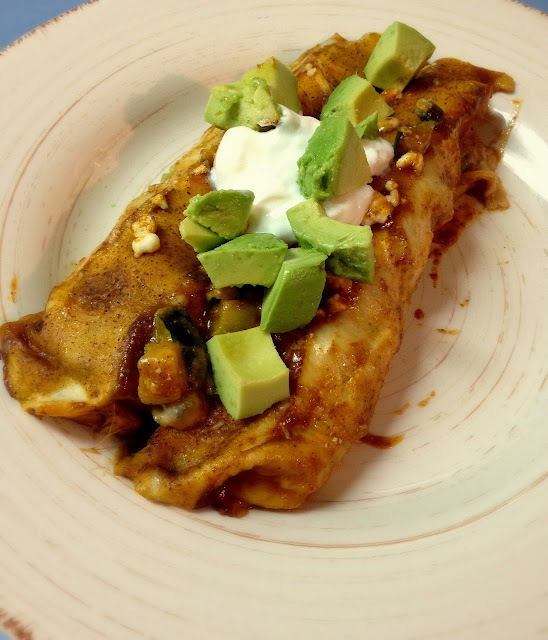 That being said, pretty or not, these veggie enchiladas are so delicious. Squishy, gooey, falling apart comfort food usually is. No exception here! I've recently discovered goat cheese and am loving it! I think, to me, it looks like feta, but tastes like cream cheese. Except saltier. Either way it's pretty amazing. Surprising you with these yummy pockets of ooey gooey creaminess. Glad we're having leftovers tonight because I'm really craving one now. Preheat oven to 425. Place the zucchini on a rimmed baking sheet. Drizzle with 2 tsp of the olive oil and sprinkle with lemon pepper. Toss to coat. Spread over 2 sheets if needed to make one even layer without crowding. Roast about 30 min. or until edges are slightly brown. Remove to cool. Turn oven down to 375. Meanwhile, heat skillet to med-high heat and add 1/2 tsp of olive oil. Add onion, saute 3-4 min. Add garlic and saute 1 min. more. In a large mixing bowl, combine the onion mixture, black beans, mozzarella, and all but a few TB of the goat cheese. Add the zucchini and toss gently to combine. Lightly grease a 9x13 baking dish and pour about 1/2 cup of the enchilada sauce in the bottom to coat. Working with one tortilla at a time, distribute filling evenly into tortillas, rolling each one and placing them seam side down in the dish, squeezing them in tight. Brush the tops with remaining olive oil and pour remaining enchilada sauce over the top. Sprinkle with remaining goat cheese. Bake 20-25 min. or until tops are just crisp and sauce is bubbly. Cool 5 min., then serve, topped with chopped avocado. Goat Cheese is one of my all time favorite cheeses! I can't get enough of it. These look really tasty! Love an enchilada in any form.